So, you are thinking about going back to school. It may seem a little bit scary or intimidating after being away for so long, but there is no need to worry. 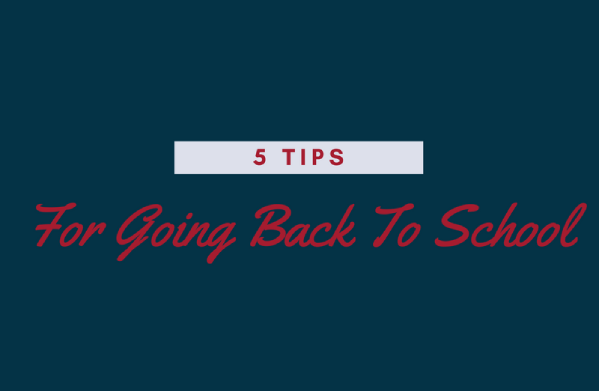 The following are a few tips to try as you start school again. If possible, meet with a financial advisor and talk about the estimated yearly cost of school. Going back to school might mean eating out less and budgeting more. The key is to live inside your means. Plan your budget with your spouse or family to set realistic expectations with everyone who is involved. List your income and your expenses, plan for emergencies, and make sure your budget balances. Be sure to take advantage of financial aid and government grants when available so you can concentrate on school. The cost of being a student isn’t always monetary. Be mentally prepared to potentially live a different lifestyle than you did as a full-time professional. With a full school load, you won’t have as much time to go out on the weekends or participate in extracurricular activities. Don’t forget why you are in school, though. The cost of earning your degree is worth some of the challenges that accompany being a student. Make sure your goals are aligned so that your time spent at school is a benefit to you. Going to school can be a time of great growth and learning if you know what you want. A project that you are doing in school could be used in a portfolio later. Help yourself by choosing a program that leads toward your professional goals. Open your mouth. Talk to instructors about various career options and other students about their dream job and professional desires. As you do so, set your own goals. Opportunities will surface as you do your research and find something you are passionate about. Deciding how you will balance your time between all obligations will help you feel successful in school and fulfilled in other aspects of your life. Decide what is important to you in addition to just educational goals. Set health and fitness goals, social and family goals, and personal goals. Write your goals down somewhere you will see them daily. Create subtasks under each goal you can feasibly accomplish and measure your progress. Set deadlines for subtasks so you can meet your overall goal on time. Lastly, be flexible. If your goal isn’t working out, don’t be afraid to change it. It’s your goal after all. A major struggle for many college students is proper time management. The fine balance of school, work, family, and personal time can be difficult to maintain. Try taking the first 20-30 minutes of your day to make a game plan. Be specific in your planning. In addition to classes, appointments, and work hours, schedule out other conversations and activities you normally wouldn’t write on a calendar. This will be helpful in identifying how much time is actually spent engaging in productive activities or wasted on meaningless or idle events. You should set a goal to spend at least half of your time in a day invested in productive activities. The key is to plan ahead as much as possible. Whether it’s writing down a list of day-to-day tasks or keeping a calendar of due dates for class assignments, try to plan each day so you can make the most out of every hour. If you find yourself becoming easily distracted or guilted into responding immediately to the needs of others, you may need to take certain precautions. Politely tell your family members or roommates to not interrupt you during homework or work time. Put your phone on airplane mode so you are not distracted by texts, calls, or emails. Instead you can schedule certain times to respond to people, like during lunch, or just after dinner. Be sure to reward yourself for achieving a goal. For instance, tell yourself you can eat a favorite snack if you are locked into homework for two hours straight. According to the Harvard Medical School, it is difficult to focus and stay attentive when you are sleep-deprived. When your brain is overworked, it’s difficult to retain information. To be successful in your courses, you must be able to learn and recall information. This means sleep should be a priority. Use phone apps or online resources like Sleepyti.me to maintain a disciplined bedtime. Sleepyti.me lets you decide what time you want to go to bed and tells you what time would be best to wake up depending on sleep cycles. This will help you wake up feeling refreshed for the day instead of groggy and grumpy. You can set an alarm on your phone to remind you to start preparing for bed. Force yourself to put your pajamas on, brush your teeth, and start engaging in a bedtime activity like reading, meditating, or writing in your journal. As you develop this habit regularly, you will signal to your body when it is time to wind down. If you tend to wake-up in the middle of the night, you might need to change your environment. You may find yourself overheating, causing you to wake up. An ideal room temperature at nighttime is anywhere from 60 to 65 degrees. You may think twice about the comfort of your mattress or pillow, and invest in quality bedding if you are uncomfortable. Some people find using essential oils like lavender or eucalyptus helpful in clearing their sinuses and calming their breathing before bed. You might refrain from taking long naps during the day so you’re tired when it’s time to go to bed. Be sure to exercise at least three to four times a week to decrease stress and consequently help you sleep better. Taking a hot bath or doing yoga right before bed to start slowing down could also help you get better shut-eye. Talk to friends, family members, and colleagues who have gone back to school after taking a long break. They may offer useful advice and help you manage your expectations. If you have any specific concerns, reach out to an instructor. They’ve likely had students in a similar situation and could be an excellent resource. It’s never too late to continue your educational journey. Many Independence University students are returning to college after a break. If you’re ready to take this step, click here.